Jezebel Investigates: Why Are Co-Star&#39;s Daily Notifications So Rude? 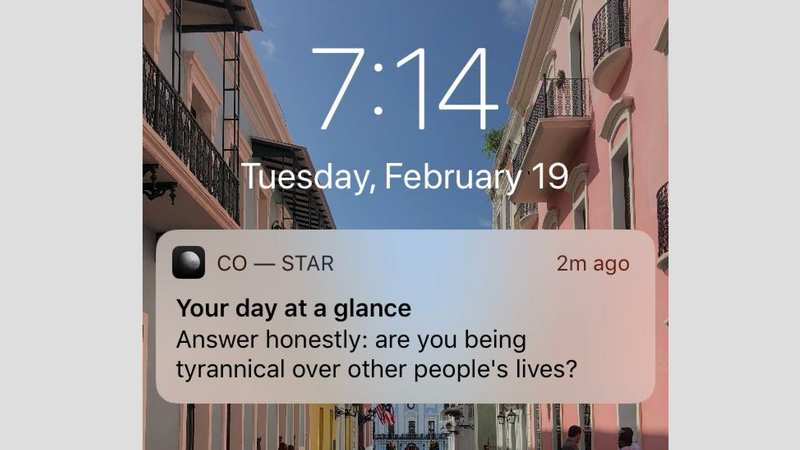 Why Are Co-Star's Daily Notifications So Rude? Last year, after months of mocking my new age-y buds, I gave in and downloaded Co-Star, a black-and-white, AI-powered astrology app that delivers “hyper-personalized, real-time horoscopes.” Not only are these horoscopes based on your birth chart (a reading that goes beyond your Sun sign—the sign you are probably most familiar with) it examines the exact minute and location of your birth to give you a closer, more intimate reading. There’s also a social aspect: you can read how compatible you are with friends and loved ones who also have the app. Personally, I find it to be as accurate and fantastical as believing in magic, but to say it’s not fun would be a lie to me, and all your hippie friends. It’s a blast—save for the rude daily notifications. Seriously? I am a PISCES. I hurt NO ONE. This one was a nice note to receive after having recently been gaslighted. No thanks. What gives? I’ll continue to use Co-Star, because I do actually enjoy these notifications, but they’re certainly a far cry from the “You’ll get lucky on the 12th, beware the 5th” monthly horoscopes that adorned the back flap of a teen magazine in the ’90s and ’00s. To receive an explanation to this pressing mystery, Jezebel has reached out to Co-Star for comment and will update this very important blog if we hear back. If they don’t drop us a line, well, the answer is probably in the stars, isn’t it? “There has indeed been a shift in Co-Star’s “Your day at a glance” notifications. We heard from the Co-Star community that our emoji notifications were too vague and decided to make a change that reflects how we see the world and the kinds of advice we give each other. And we’ve been getting a lot of feedback about the new notifications. We’ve been laughing at a lot of the memes and reactions, but we’ve also seen that some are still too vague or go a bit too far. So, we are working to find the right formula for our community. We’ve already changed a lot of the content that our AI uses to generate the notifications. That’s why most of the more extra Tweets are a few weeks old.